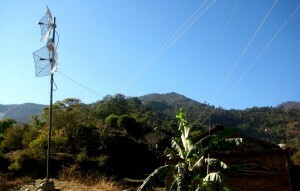 After a long wait networking at Doti finally started in mid of November 2011. Initially, it was planned for June/July 2011. But heavy downpour and poor weather conditions made it impossible to work during monsoon season. All the equipments required for the networking were already in place and had been moved to the World Food Program Dadeldhura office by the end of June, making travel much lighter and hassle free (even then our luggage was overweight by 15 kg, but we were able to convince airport crew about our project and didn’t have to pay for the extra weight). With detail plan and preparation, networking team (Ram Krishna Singh and Basanta Shrestha) boarded Buddha Airways for Dhangadhi on Nov 18th. At Dhangardi, in hazy evening we strolled down in search of iron poles required to hold antenna in place and make them stable. One of the main reason of unstable Internet connections in the existing schools and relay points at Dadeldhuda, we found, was due to the constant wavering of the antenna position. This time, with these poles in Â relay points and schools, we wanted to negate this effect to large extent. At Puri Suppliers, Chauraha we bought around 35 ft of iron pipes and had them cut to pieces, of required length. We walked back to hotel discussing next day’s plan. At Silugadi, our first task was to get new ADSL line from Nepal Telecom Office. Before getting a line, we talked to a NT staff, who had agreed to put relay at his home in our survey visit. But to our surprise and dismay, he started asking for personal favor. We were in no position to meet his demand and instantly started working on alternate plan. Fortunately, near by Ncell tower, there was a FM station, Saileshwori FM, with ADSL line. Â We approached them and discussed about possibility of sharing the ADSL line. Station manager was very excited about our OLPC project and Â was more than happy to help us for which he thought is noble cause. After meeting, Basanta started his at FM station, and I walked to the Ncell tower to manage a separate power line for our antenna. Ncell tower supervisor, Besh Raj, was waiting for us at Silugadi tower. Â We asked him if he can arrange a helper to fix antenna at Ncell tower. Besh Raj was very amicable and managed one college student Lokendra, who later on turned out to be a very quick learner and remained with us for good 10 days. With the help of Lokendra, we fixed two antennas at Ncell tower, Silgadi one pointing towards Khatigaun Ncell tower and other to Mauwa relay point. Satisfied with dayâ€™s work we went back to lodge [Lord Buddha] where we have set up our base. Early in the morning, Lokendra showed up in the lodge with his friend Basanta and we were team of four. After an hours drive from Silgadi, we reached Khatigaon Â and fixed two antennas in Ncell tower one pointing Silgadi and other to Mahadev school relay house. Another major relay point was Ncell tower at Mauwa VDC. After long discussion, we planned to connect Mauwa relay point to Silgadi first, then connect Khatigaon to School Relay house later, and accordingly headed towards Mauwa. Near by Mauwa Ncell tower, in the direction of Silgadi, there was small hillock which blocked clear visibility of Ncell tower at Silgadi. But we kept working hoping that it won’t affect much. By this time, WFP staff Rajan Khatiwada got so much interested in our work that he started climbing up and down the Ncell tower(which normal people including me would not dare) and fix the clamp and antenna. After completing setup we tried connecting it to Silgadi relay point, but it didn’t work out. Tried all the tricks but in vain. Tired and frustrated we all came back to local lodge “Nawaraj Ko Hotel”. One good thing about this lodge is it’s food. Highly recommended lodge to be in if you ever happen to visit this place. Next, we sent Lokendra to Silgadi end to fine tune antenna while we stayed back. There was load shedding in Silgadi and couldn’t test connection till afternoon. We fine tuned antenna at both end but still there was no sign of any connection. At this point, we cursed ourselves for not learning Â “Radio Mobile” software and checking the viability of connection in this software before implementing it. Radio Mobile is a free and powerful tool used to predict the performance of a radio system. It uses digital terrain elevation data for automatic extraction of path profile between an emitter and a receiver. This data is added to system, environmental and statistical parameters to feed the Irregular Terrain Model radio propagation model. Elevation data is also used to produce virtual maps in background. Radio Mobile Â can be used to plot coverage and design radio links. It is able to create plot that is as accurate as the plot from expensive commercial packages used by my hardware vendors. Lesson learnt, from now on, we will make sure that performance and viability of connection of the radio system in Radio Mobile is checked prior to its implementation. Here we were on the 7th day(25th Nov) of the actually planned 12 days trip with nothing working on our favour. We haven’t connected even a single relay point, forget about the schools. Team members, specially Basanta, was having sleepless night with constant coughing. Frustration and fatigue started showing up in the form of irritation and differences among the team member even in minor issues. In the evening, wearing long faces, we were shambling around the Mauwa tower and approached to near by hillock to have a view towards Silgadi. To our surprise and entirely unexpected, Silgadi relay point and both schools Sri Saraswati & Durga Primary were visible from this vantage point. Suddenly with renewed hope we discussed connecting Saraswati and Durga school with Silgadi via Khatiwada gaon and Bajh ko Mod relay points. With this new plan and little remaining hope, we came back to Silgadi, arranged necessary equipments for new Khatiwada relay point and Saraswati Primary School. We called and explained our new plan to Shiva Raj Khadga sir from Saraswati and asked to make necessary arrangement accordingly. Next day, before heading to Khatiwada gaon, we fine tuned the antenna, checked and reconfirmed the connection at Silugadi tower. After 2 and half hours walk, we reached the destination. After short discussion and agreement with principle at Shree Devi school at Khatigaon, we used this point as one of the relay point as we had planned the previous day. With clear line of sight and shorter distance, connecting these two points were pretty easy. After successful connection, I left Khatiwada gaon for Silgadi early in the morning, picked up the necessary equipment and headed towards the “Bajh ko Mode” relay point. By mid day, I was there at the Bajh, but to our utter dismay, there was no electricity in that location which could power our relay point. After much dialogue and considerations among team members and teachers, we decided to use Khema[Principle, Durga Primary School] madam’s house as a relay point. By this time, Basant was working at Saraswati school and had completed installation at his end. With little fuss, we were able to connect Khatiwada relay point and Saraswati school. Heart full of thanks goes to Shankar Khadga sir, principle from Saraswati Primary School, for all hard work and effort he has put in, in installing relay point at Khema mam’s place. Basanta went and connected Durga school to Saraswati School without much complain. Mission accomplished. With this success, we were gaining back our confidence and lost vigor. We had at least something to show and report at office. Finally, with much relief and day’s work we walked down to the village to watch Bhauwa Dance with free flowing Theula. With hangover and Bhauwa tune still lingering in our head, we contacted OLE Office, updated our status and discussed about possibility/viability of connecting Mahadev school, with 8 relays in between, to source at Silgadi. After much analysis and consideration, we decided not to connect Mahadev School for timebeing. There still were some works left to be done before returning back to Dadheldhura. 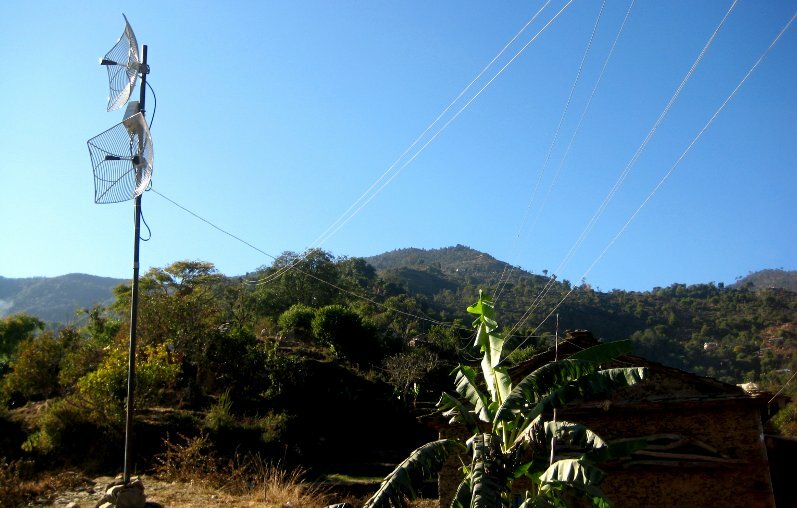 The antennas those were mounted at Mouwa and Khatigaun Ncell tower had to be dismantled and taken back along. The following day we called for WFP vehicle from Dadheldhura, picked up our local antenna mount expert Lokendra from his college at Silgadi and went to Khatigaun to dismantle the antenna. We set out for Dadeldhura at about 3 pm. Our arrival to Tufaan Danda was delayed by an hour because on our way back the road was blocked because of an accident between a truck and passenger Jeep. It was very difficult to figure out whose mistake was it but as it was apparent, the truck had gone out of its way and hit the jeep. The following days we visited schools in Haat, Hamtad and Budum, updated the softwares on laptops and school servers and maintained their school network. Developing a hierarchy of dependent packages for schooltool and its plugins. Finding source tarballs for each packages. Writing RPM spec files for each package and build binary RPMs against the spec. It was daunting to perform all of the tasks manually, so we followed a semi-automatic approach â€” a script based automation and manual intervention where necessary. But writing spec files for building RPM packages for each dependency had to be manual, meanwhile a difficult task as well. Hopefully, we need not have to author spec files for around 80 dependencies; thanks to Robin ‘Cheese’ Lee for writing a few of them. Nevertheless the rest of them had to be authored, built against and tested; and it took us a good time performing these tasks iteratively until we arrived a stable stage. Now we are ready to pilot SchoolTool (localized in Nepali) in a few of the OLPC deployed schools. Download the respective repo file you need for your machine â€” fedora_9.schooltool.repo for Fedora 9, and fedora_13.schooltool.repo for Fedora 13. Copy the repo file to /etc/yum.repo.d/ directory. The packaging sources (spec files and patches) are available at my git repository at http://gitorious.org/schooltool-rpm/schooltool-rpm/. We would like to see more people testing our builds and our specs and reporting back bugs. HAPPY TESTING!! The E-Pustakalaya team met with the E-Pustakalaya Advisory Panel for the second time on July 12, 2010. Some very interesting ideas transpired. On the issue of copyright, E-Pustakalaya was advised to allow exclusive licenses according to the wishes of authors and publishers apart from the general creative commons license E-Pustakalaya uses for materials already available in the public domain. It was also decided that the E-Pustakalaya web page would have a section that features information onÂ Authors/Publishers and their works, which will further promote their contributions to the digital library. Also given the dearth of adolescent/young adult literature in Nepali, OLE Nepal will be one of the first organisations to hold a writersâ€™ workshop targeted specifically towards the creation of such literature. The workshop will include introductions by child psychologists, teachers and parents, to help suggest themes and issues relevant to young adults today. This will be followed by a multi-day workshop headed by the E-Pustakalaya Advisory Panel members. The resulting works, if up to mark, will be published electronically on E-Pustakalaya. The Advisory Panel members also presented their must have book lists for E-Pustakalaya. The library team was also advised to contact the Curriculum Development Centre (CDC) who have produced a must have children’s literature list of their own consisting of some 50 titles. OLE Nepal is working on adding these works to the library. Finally, OLE Nepal is moving ahead with plans to make audio books for its E-Pustakalaya. This is a niche that E-Pustakalaya being a digital library can easily fill and make available on a large scale. They will be useful for students at our programme schools as well as to Nepali parents around the world who are constantly looking for materials in Nepali so their children growing up abroad can still read, write and understand Nepali. The first audio books will be made with poems by Ram Babu Subedi and stories by Dhruva Ghimire, both prominent writers in the world of Nepali literature. OLE Nepalâ€™s newsletter for May-Jun is now available. The newsletter intends to keep its readers uptodate on the organisation and its activities. OLE Nepal’s newsletter for Mar-Apr is now available. The newsletter intends to keep its readers uptodate on the organisation and its activities. The Mar-Apr issue includes latest updates and stories on how the names ‘E-Paati’ (XO) and ‘E-Paath’ (our interactive activities) came into being and how they illustrate what this project stands for; and on a new leadership component that has been added to the teacher training programme this year.